The Ford Flex Limited EcoBoost has many benefits behind its good looks. A short test drive on any given vehicle can provide a certain “feel”. However, you don’t really know it until you have driven it for a few hours. When I recently traveled to Ohio to pick up a new Airstream with the 2011 Ford Flex Limited EcoBoost, I felt I knew exactly what to expect as I have driven many customers’ Flex models and because it sits on the same platform as the Taurus SHO we ran for a couple of years. The solo drive to Ohio with the Flex Limited was what I expected. It was comfortable, quiet and could really move if I wanted it to. Later that afternoon, when I was driving home towing a 27’ Airstream in a harsh thunderstorm with 50 kph wind gusts, I realized how competent and reassuring the Flex is. The styling of the Flex has been controversial since its introduction. People either love it or hate it with a few in between. Personally, I like its simple clean lines. Also, in my opinion, colour choice makes a huge difference in the appearance of a vehicle. So, before you discard the Flex as an option, perhaps check out the many different paint schemes available. The drive train is almost identical to the Taurus SHO expect the Flex has a 3.16:1 final drive or axle ratio compared with the 2.77:1 ratio we had in our Taurus SHO. The Taurus SHO with the performance package option has the 3.16:1 ratio. At a cruising speed of 100 kph in 5th gear, the Flex turned 2200 rpm versus 2000 rpm on the Taurus SHO. The extra rpm certainly makes the Flex feel more powerful in 5th gear at highway speed and when towing a more conventional shape trailer, the fuel mileage was a little better than the Taurus. While towing the Airstream, the mileage was hindered as it produced 17 L/100 km or 13.8 mph to the US gallon at 100 kph compared to 15.8 L in the Taurus. What was interesting, however, were the 0-60 times were nearly the same. "The Taurus was more economical as a solo vehicle". I connected an Avenger trailer to the Flex (similar to the one we used in a previous Taurus SHO test published in RVL Volume 42, Number 4) and it delivered 12.2 mph US gallons and 19.3 L/100 km. So, the higher axle seems to help with the conventional trailer. The Taurus was more economical as a solo vehicle, however, the Flex was still excellent for an SUV. It had a steady cruise of 110 kph that turned in 9.2 L/100 km or 25.5 mph US. As with the Taurus, the Flex has a very nice engine fore towing. It’s quite economical and has blistering performance when you want it. The engine works well in the Ford F150 but in more efficient vehicles such as the Flex, it simply shines. If you read the article comparing the standard Taurus to the EcoBoost, there are similar differences with the gearing in the non-EcoBoost Flex. The front-wheel drive, naturally-aspirated Flex has a 3.39:1 final drive ration and the all-wheel drive has a 3.65:1 ratio. The Flex, at 4,900 pounds, is 500 pounds heavier than the Taurus SHO so neither vehicle is light weight. Considering how light the aluminum drive train is, most of this weight is in the solid body structure. The other difference between the Flex and Taurus SHO is in the suspension tuning. The Taurus has a very firm and tightly-controlled suspension with precise tires that delivers sports car-like handling. The Flex is tuned to be softer, so the ride is comfortable and while it’s not as dialed in as the SHO, it is still respectable. I would say that while the spring rates are perfect, it could use a little more shock control at times. Straight line highway stability is very good due to the five-inch longer wheelbase and shorter rear overhang of 48 inches. This works out to 40 percent of the wheelbase compared with 48 percent on the Taurus. The Flex was equipped with P235/55R x 18” tires which is normally a good size on a tow vehicle but they were definitely designed to ride smooth first and handle second. A more aggressive handling tire would really tighten up the handling and though the ride would be slightly firmer, it would still be very comfortable. What appeals to our customers who own a Flex is the seating position, which is higher than a car and the ideal height for easy entry and exit, yet it still has a relatively low centre of gravity. Around the time I was driving the Flex, I had a meeting in Phoenix, AZ. We stole a day to drive up to the Grand Canyon. Since there were five of us, I first requested a Dodge Caravan from the car rental company but as they were not available, they upgraded us to a Lincoln Navigator. The speed limit in Arizona is 75 mph, but traffic moves at 80 mph. For a full size conventional SUV, I like the Navigator with its independent rear suspension. However, at 75 mph, I felt it was as fast as I wanted to drive the vehicle. Any extra input to the steering caused it to sway. It also felt very top heavy after driving the Flex (part of that difference could well have been the tall sidewall 18” tires on the Navigator). I couldn’t resist on making a comparison with the Flex, as it felt completely stable well above 75 mph (not that you should drive that fast but the extra margin of control is nice). The Navigator is currently being re-engineered with an aluminum body, which will lighten it by at least 700 pounds. This should help lower the centre of gravity and improve stability. 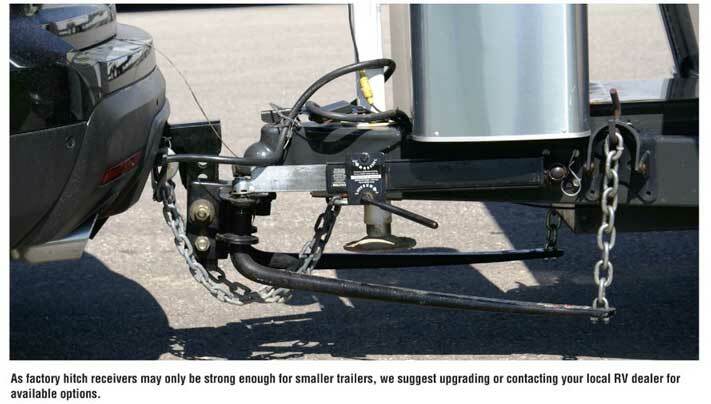 Like most vehicles, the factory and aftermarket hitch receivers are not strong enough for anything but the smallest of trailers – even the 4,500-pound rating on the factory hitch is overly optimistic. The Flex Limited had every option except for a sunroof and TV monitors so there’s no shortage of gizmos available to play with. One thing I liked was the power folding rear seats. There were no leavers or straps to pull – just push the button and in a few seconds they convert from a flat floor to an upright position. There’s even a tailgate position. In the third row seating position is a large, deep storage area. "In a drag race, it is no contest – the Flex leaves diesels behind." Of course, you don’t really need the EcoBoost option and pricing for a base model, front-wheel drive, Flex is $30,000. While it comes standard with all the necessities, consider budgeting for the $400 and get the better 17” tires. To get the EcoBoost engine, you have to purchase the Limited model which starts at $51,000. What many people compare the Flex EcoBoost to are the diesel SUV’s. If you don’t need six seats or as much cargo space, a base model Touareg is approximately $5,000 more. The diesels have massive torque at 430 lbs. ft. versus 385 lbs. ft. in the Flex and only 230 hp versus the EcoBoost’s 345 hp. In a drag race, it is no contest – the Flex leaves diesels behind. The diesels do provide better fuel economy but not substantially. So, with the higher maintenance costs, it may be hard to build a case for cost effectiveness. Also, there are often rebates and interest rate programs on a Flex which are rare on imports. If you need seating for six or seven, perhaps compare the Mercedes GL or an Audi Q7 which have more than a $20,000 premium over the Flex. However, if you’re looking for good value in a versatile six or seven passenger tow vehicle, test drive a Flex and for some extra fun, test drive the EcoBoost. Originally published in RV Lifestyle, Volume 43, No. 4.